We have egg(s)! 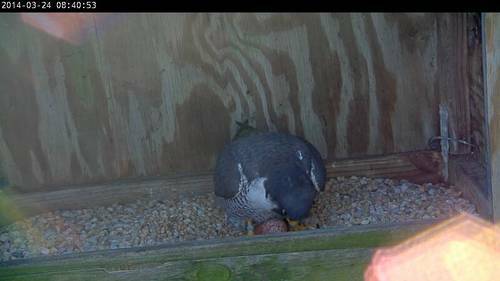 Although copulation has likely been taking place off-camera for a few weeks now, the pair has been documented copulating on multiple occasions since March 19 (last Wednesday), and, sometime on the afternoon of March 23, the female laid what appeared to be the first egg of her clutch. However, a glimpse of two brown objects beneath the male that same evening (see image below), raises the possibility that the female had previously already laid an egg on March 21. 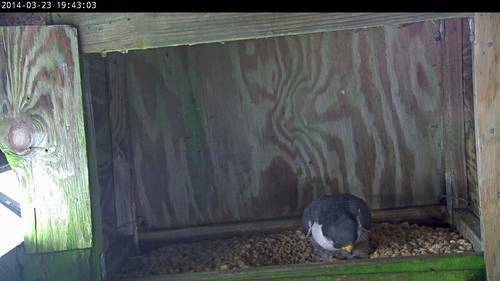 On this day she had been observed at the nest box for extended periods of time, looking lethargic, which is typical of falcons carrying an egg. Only one egg is clearly visible in the second image, again of the male, taken today. The female should continue laying eggs at 2 to 3 day intervals until the clutch is complete. Although they had a five egg clutch for the first time last year, this pair has consistently laid four eggs per season. Incubation typically begins in earnest once the third egg of the clutch is laid, but incomplete clutches will be covered during rainy weather and during cold periods such as what we are currently experiencing. As for the number of eggs currently in the box … the physical structure of the nest box makes it challenging to see the eggs, which are often hidden by the strip of wood at the box entrance. We will be able to get a definitive count as the number of eggs in the box grows; in the meantime, we may need to continue relying on fleeting glimpses.